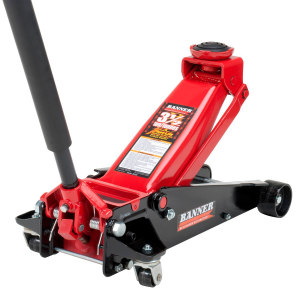 A floor jack is one of the essential tools for car repairs and maintenance. Most cars, trucks, SUVs are equipped with a factory jack for lifting cars. However, doing some lifting and repairs may require more than just a jack. When it is time to crawl under your car, the scissor jack that comes with your vehicle may not be capable of lifting and supporting the weight of the vehicle. Buying the floor jack is the best option to carry these functions. For customers looking for a budget-friendly floor jack, the Blackhawk B6350 Service Jack works quite efficiently thanks to the unique technology design. The floor jack has a lift range of 6 inches to 21 inches with a 3.5-ton weight capacity that’s perfect to lift most cars, SUVs, ATVs, pickups, and trucks. The car jack has a swivel rear wheels that make the tool easy to use and an internal safety valve to ensure safety during operation. The floor jack has a bypass device that prevents the machine from overpumping during lifting. The jack meets and exceeds ANSI standards with a lifting capacity of 7,000 pounds. The floor jack is a remarkable tool for mechanics and DIYers in search of a super lightweight, durable and heavy duty jack. For a smooth experience, the Blackhawk B6350 Service Jack won’t disappoint you. The jack is made using modern, innovative technology, and its heavy-duty steel construction provides safe long-term durability and the high-performance output. It comes with a year warranty starting from the date of purchase. The swiveling wheels have a 360-degree rotation range, and the knurled grip prevents any form of slippage when using. The jack is easy to move around with a safety feature that protects the device from being over-pumped when trying to lift the object. The product stands out and has received an average 4.5 customer star rating. The jack surface has a foam bumper to prevent the jack from causing any damage to your car. The Blackhawk B6350 tool has a rust-resistant finish and a heavy gauge steel frame that provides strength and extended lifetime. The car jack is easy to use as it lifts a vehicle in a matter of seconds with just a few or little pumps, and lowering your vehicle requires just a push bottom to release the pressure on the Jack. The minimum lift height will fit most cars, trucks, SUVs, ATVs and much more. The car jack is the best on the market today.